When I looked back recently on the last three months of 2018, I realized I had quite a LOT going on, which is why I never got back to posting after mid-summer. I'm sorry about that, as I so enjoy reading others' blogs, and so many of those I follow year-round are totally diligent about posting and sharing regularly - a few times a week, if not more often. Some of those folks generate real income from their blogs, and my hat is off to them. Unfortunately, my life at the moment doesn't allow me the time to pursue that approach to my blogging, as evidenced by my lack of posts since summer. Autumn, in fact, probably is my most favorite season of the year, but this autumn was loaded with other activities for me, and the most unseasonable autumn weather that I've experienced here in the Northeast in years, if not ever. It was damn cold and snowy far earlier in the year than we normally see...it was frigid, snowy, icy and, in a word, just plan awful more than it was lovely and gorgeous. The only saving grace was the autumn color, which was quite late to emerge into peak foliage this year, but we did see it, for a while anyway. 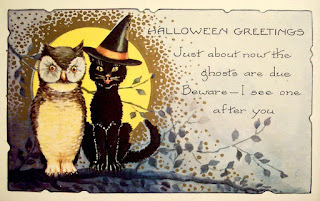 By early November, I had survived the siege of Halloween (never my favorite holiday for various reasons), but I have to say, I was very impressed with the politeness of the young trick-or-treaters who rang my doorbell this year. That was quite a pleasant treat for me, so, while I might have questions about the GenXers, this latest generation of young adolescents does give one hope for the future. I hope those I encountered are the norm and not the exception in their generation. And the doorbell ringing ended fairly early (by 7:30pm) at my home, which was a blissful relief. 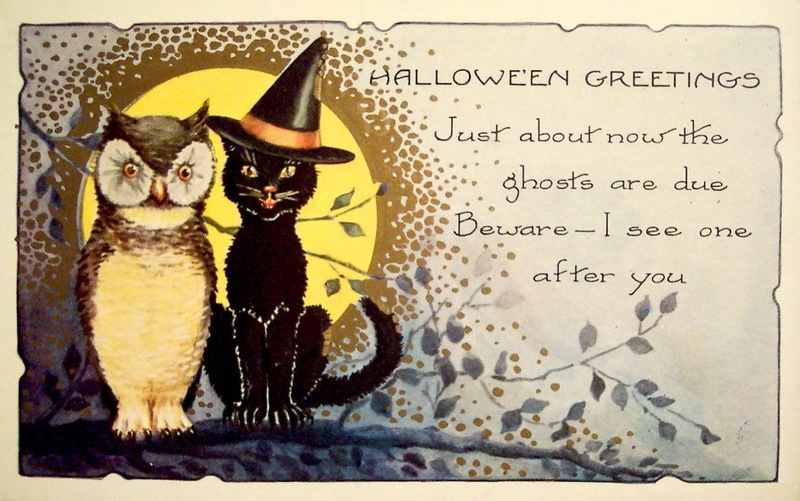 I think the more overzealous teenagers, who, to be honest, are too-old-to-be trick-or-treaters, might just have "aged out" in my neighborhood and did not appear this year as they had in the past. I'm thankful for that small favor, for sure. One of the more fun things I do like to do in mid-October is an annual country church sale to benefit the local congregation. It's a fun sale and auction that offers something for everyone and I'm happy to say I have become an ace "picker" of vintage items, so I was thrilled to find, at the bottom of a box of dusty and dirty pots and pans, a perfect, bright yellow enameled saute pan. I wasn't certain, but I suspected, at first glance, that it was a bonafide Dansk enamelware pan covered in a thin layer of dust and grime. That might have been a bit daunting to some, but I usually can tell, despite the dust and grime, whether an item is a true "diamond in the rough" and there no other indication of damage or use on this lovely pan, so I knew that it would clean up beautifully. I snagged it for the astounding price of $3! Truly a steal! 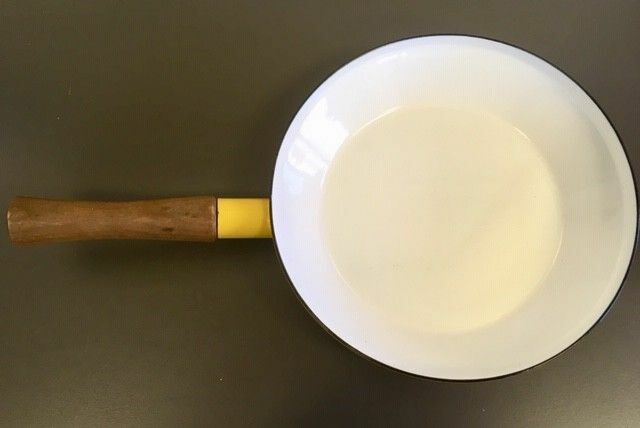 These older pans from Dansk usually sell for upwards of $50 as they are becoming increasingly hard to find in such pristine condition. What a satisfying score! Along with this nice pan. I also purchased a couple of older, vintage cookbooks in the burgeoning book tent, for a whopping 50cents total! That's what makes the sale so great -- simply great stuff for very little money. So little, in fact, that I often give the salesclerks at each area of the sale where I purchase items more than they're asking for in payent - it's all for a good cause in one of my favorite communities, so I appreciate the insane bargains. I always have had a special affinity for housewares, particularly those involving cooking and dining. I still have a classic, fabric covered ring binder in which I'd saved decorating and cooking/dining pages from old issues of Glamour and Mademoiselle magazines from when I was a young teenager (we're talking mid-1960s here - when Julia Child's program, "The French Chef", was just beginning to appear on public television.) I think I have been "nesting" mentally since I was about 13 and my tastes were just starting to forming. Of course, my taste in decorating and cooking/dining certainly have changed and evolved since as I have aged, but I've always been drawn to classic items with traditional style. I liked contemporary when it was the thing in the 1970s, but by the early 1980s, my taste (and lifestyle with horses) had evolved to the point of preferring the English country manor house style as I traveled more in my 20s and 30s. I've pretty much stayed in that genre ever since from an architecture and decorating perspective, and have gradually edited my collection of items - plates, linens, etc - to refine that taste and add only very well made and well designed, classic items. 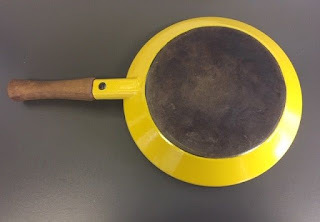 That said, even though Dansk is considered a mid-century modern brand, I've always liked their items for their clean simplicity, hence the appeal of the yellow saute pan. Thanksgiving and Christmas were literally a blur of activity for me - no travel involved, fortunately, but way too much snow way too early in November, which kind of took away a bit of the glow of the holiday season, making the first snow a bit less special than it would have been with the arrival of Thanksgiving and early December. Notice also, that given the calendar this year, Thanksgiving arrived on what I think was its typically earliest date on November 22 -- a good 9 days before the first of December, so it pushed the arrival of the "holiday" season fairly early in November. That seemed a bit odd, but I'm sure is what contributed to a robust holiday shopping season for most retailers. My Thanksgiving celebration centered around dinner with three other long-time friends I've know through horses for decades - we've all known each other for between 15 and 30 years, so a genial group and a fine dinner that I helped to prepare. We are all meat-eaters and the turkey provided by our hostess was cooked well and happily enjoyed. 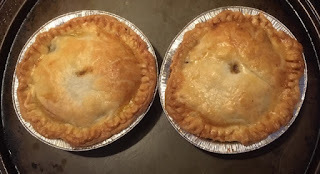 As I often do, I used some of my left-overs to make several turkey mini-pot pies, which has become one of my favorite ways to use up left-over turkey. I don't follow any particular recipe and confess I do use store-bought crust because I don't usually have the energy to make a crust from scratch. To the cooked meat, I add whatever I have readily available - some sauteed onion and celery chopped into small pieces, chopped roasted carrots, some herbs - thyme, primarily, salt, pepper, garlic powder and some gravy - whatever is ready to go and easy to add. I often cut out a turkey-shaped piece of pie crust to put on top of the pie, so it adds a festive touch and helps identify what type of meat is included. So far, I haven't had any complaints on these tasty little "personal pan pies" so far. Christmas was, after a frenzy of activity leading up to the holiday, a blissfully quiet day for me. No complaints about that at all after a busy late summer and autumn season. I'll take it as a quiet time to savor the season and reflect on my many blessings. And we even did get a bit of snow - just a dusting, fortunately - on the morning of Christmas eve to add a festive touch to the holiday flavor, but not so much snow as to make travel hazardous here. Phew. Above are a few scenes from the holiday decorations outside my home this December. 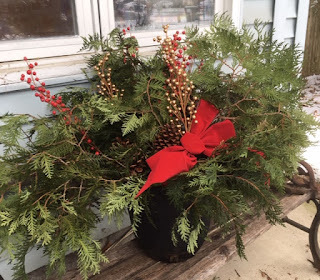 I had to trim some low-hanging branches from a cedar tree next to my house and I decided to use them as a big, pot of seasonal greenery on the bench on my porch. 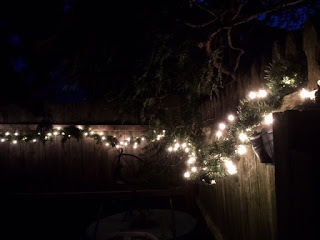 I also had gotten some pre-lit faux greenery garland and strung that on the fencing beyond my patio - that gave a nice glow to the yard each evening. I'll be pulling it down and putting it away after New Year's...but it has been a treat to enjoy these nice seasonal holiday touches. Now, the new year is upon us. No resolutions for me - I'm just resolved to do good things for others and be kind. I have much to be thankful for in my life, and much to look forward to in 2019, so I'm wishing you all the happiest and healthiest of years ahead - and thanks for reading along!